You can save money choosing an above ground storage tank to house large quantities of hazardous substances that your company handles regularly. 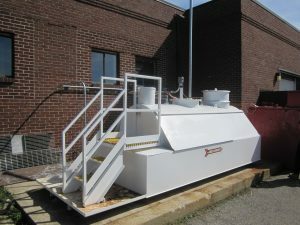 The tanks can be less expensive than underground storage tanks, and installation is far less costly. 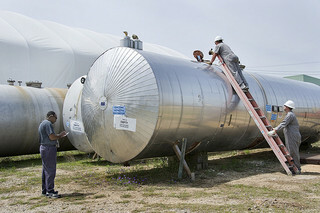 But there are still important responsibilities that come with an above ground storage tank, especially the need to take every precaution against spills and leaks. It’s not just a matter of paying your fees and complying with regulatory requirements. Environmental and public health and safety are at stake. If your above ground storage tank leaks, or you cause a spill, that could cause widespread damage and lingering concern. Tank failure – Corrosion can cause tanks to rupture, as can shifting or collapse that result from improper seating. Piping failure – Pipes can corrode, too, and they can also suffer mechanical breakdown. Loose components allow leakage. Poor maintenance – Lack of proper oversight, failure to replace fuel filters regularly or failure to keep your tank and the surrounding area clean can all degrade your system’s reliability. Dispensing problems – Equipment can fail, fuel may be drippled on the ground, outlet valves can be left open. Delivery problems – Inattentive operators can overfill the tank as well as spill fuel. Lack of physical safety and security precautions – Your entire tank could be at risk for accidents, vandalism or other physical damage if it’s not well-protected. Spills and leaks can cost you in several ways. You’ll get to fill out a lot of paperwork, and you’ll probably have to pay a fine. You might even be officially “upgraded” to receive more intensive ongoing scrutiny. You’ll have to prepare and implement a remediation plan, unless you’re very lucky and your leakage is considered only “incidental” by officials. Remediation can be very expensive. You’ll have to pay for repairs or even total replacement of your tank and its associated piping and fittings. Meanwhile, your business will suffer from lost productivity. You could even lose sales. A significant spill or leak will undoubtedly garner you the kind of publicity you do not want. That will be another distraction from your work, and it can permanently damage your reputation. Have we properly labeled all system components, using the colors and symbols that instantly indicate what’s inside the tank? Do we follow required monitoring and record-keeping rules, and maintain those documents where they’re easy to find? Do we regularly conduct a visual inspection of the tank and its components, including the secondary containment structure? Even the most sophisticated electronic monitoring system can’t see corrosion. Your goal is to identify impending problems before they can cause a spill or leak. Do we keep our tank and the surrounding area free of debris that can harbor moisture or other corrosive elements? Have our employees been thoroughly trained on operations policies and “best practices” procedures? You can employ the services of a professional environmental consultant to help review your health and safety precautions and procedures, to ensure your above ground storage tank system is in good shape and that you’ve taken every reasonable step to keep it that way. And if an accident does happen and you experience a spill or leak after all, your consultant can help you determine the fastest, most effective and most cost-effective remediation plan. Contact one of Walden’s experts today at to make sure your AST is in compliance!